Sweet Potatoes: An Old Crop That’s Become New | Chatham-Kent Agriculture Development | We Grow For the World! There is an old crop that seems to be making some huge inroads into our food system. The sweet potato is an important root vegetable crop. The sweet potato is not related to the potato (they are not even cousins) and is commonly confused with a yam, which is a variety of sweet potato grown in the Southern U.S.
Sweet potatoes are native to parts of South America. Native North Americans were already growing sweet potatoes when Columbus came in 1492. China is the world’s largest supplier of sweet potatoes, growing 130 million tonnes, or 80 per cent of the world’s supply. Approximately 60 per cent of China’s sweet potatoes are grown to feed pigs. The rest is for human consumption and other products. North Carolina is the leading U.S. state in sweet potato production, providing 38 per cent of that nation’s total. There are many food uses, including candied sweet potato, sweet potato pies and sweet potato fries, which is becoming very popular in restaurants. Sweet potatoes are fat-free and cholesterol-free, low in sodium, and easy to prepare. They are rich in complex carbohydrates, dietary fiber, beta-carotene (a compound your body converts into vitamin A), vitamin C, vitamin B6, manganese, and potassium. Sweet potatoes contain nearly half of your daily requirement of vitamin C. Along with beta carotene, these vitamins make up the antioxidant nutrients scientists believe may help prevent heart disease and cancer, bolster the immune system, and even slow the aging process. For only about 120 calories per medium sweet potato, they are a great all-around package. Despite the name “sweet”, it may be a beneficial food for diabetics, as preliminary studies on animals have revealed it helps to stabilize blood sugar levels and to lower insulin resistance. We have a few sweet potato growers here in Chatham-Kent who supply some of our areas food vendors, including some of our local grocery stores. Also, if you are driving south out of Blenheim on Highway 3, on the right hand side of the road just across from the Blenheim Golf Club, you can drive into the laneway to Gladstone Farms and purchase a small bag of sweet potatoes. 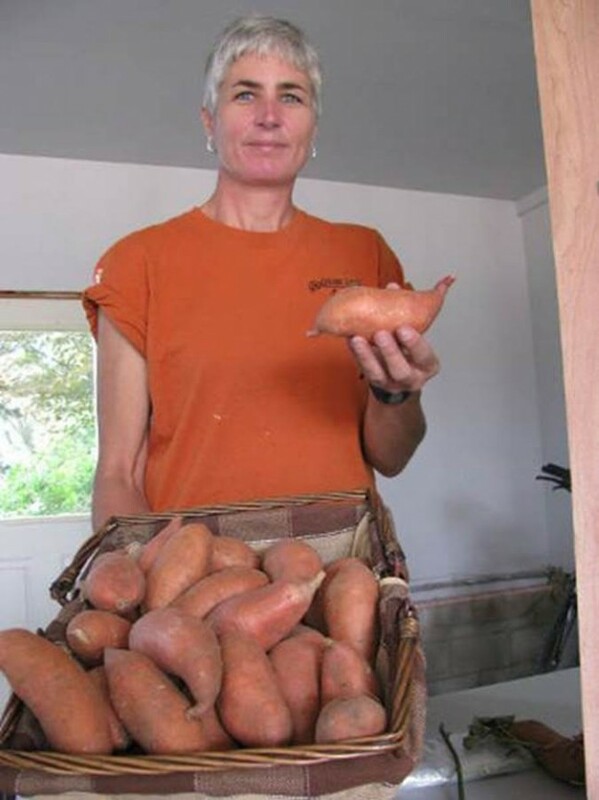 Paul and Patti Watson from the Tupperville area sell organic sweet potatoes and can be contacted at 519-627-0566. As well, Vink Farms on Oldfield Line in Chatham sells sweet potatoes and can be contacted at 519-809-0376.So go ahead and try something old for maybe the first time. I recently baked two sweet potato pies and they were delicious. If I can do it, so can you. If you are looking for some family fun the next few weeks, the Thamesville Maze, Pumpkin Patch & Fun Farm (519-692-5451) would be a great place to visit. This year, the maze features a tribute to the 100th anniversary of 4-H. There is lots to do for all ages. Think about this – In creation we see God’s hand. In redemption we see God’s heart.